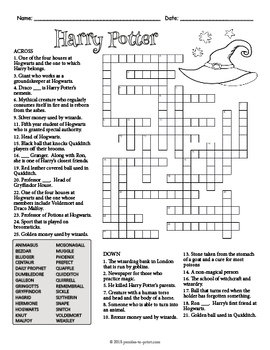 Use this crossword puzzle when reading Harry Potter and the Sorcerer’s Stone or anytime you want to introduce everyone's favorite wizard to your class. It includes unique vocabulary from the book as well as character names. Crosswords make a great introduction to a lesson, but they could also be used for a test. The puzzle comes in two versions: one with a helpful word bank (good for less experienced puzzlers) and one without the word bank for a more challenging worksheet. 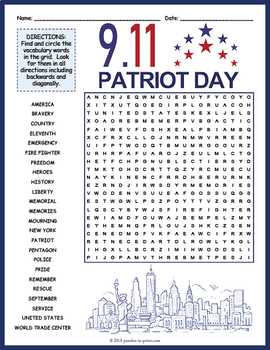 There are also options for printing the puzzle either in color or with black outline drawings which the kids can color in. In total you have four different puzzles to choose from. 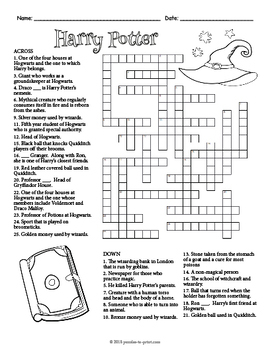 The vocabulary words covered in this crossword are: Animagus, Bezoar, Bludger, Centaur, Daily Prophet, Dumbledore, Galleon, Gringotts, Gryffindor, Hagrid, Hermione, Hogwarts, Knut, Malfoy, Mcgonagall, Muggle, Phoenix, Prefect, Quaffle, Quidditch, Remembrall, Sickle, Slytherin, Snape, Snitch, Voldemort, and Weasley.